We have been touched by the most joyful news in the world. Someone in our lives, probably several people, prayed for us, cared for us, and invited us into conversations about the living God who sets hearts free and invites us into the fullness of life available through Jesus. Is there someone you care for in this way, someone to whom you can extend an invitation to join you for a gathering of good food, good people and good conversation about the beauty and goodness of God? 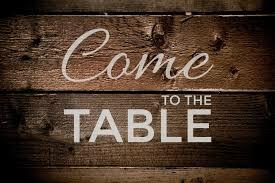 Bring a friend next Thursday night (March 30, 6:30pm) to join me at Foodheads Restaurant for Come to the Table. We’ll enjoy a wonderful meal and talk about the intersection of food and faith, touching on topics like hospitality, community, justice, beauty, and reconciliation along the way. Take a risk with someone, step out in bold faith, and let the Lord do what only He can do. See rsvp details below.